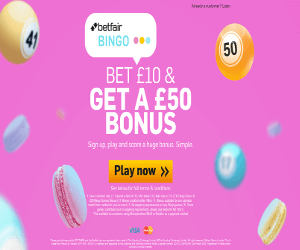 Home to over hundreds of online bingo games, slots and other games, Betfair Bingo offers you the most unique games to play of all time. Scoop up riveting rewards from this amazing bingo site and receive awesome bonus starter bundles. Betfair Bingo offers its players amazing slot games to play. The slot games available to play at this site are exciting, lively and rewarding! There is also a sum of progressive slots, which make the gameplay more exciting! Double Juicy slots is one of those games that will satisfy your summer cravings! With 5 reels and 20 paylines, enjoy smoothies of all sorts on the spot. The game is pretty straight forward. Land symbol combinations on active paylines to receive wins. The Double Juicy logo acts as the wild symbol. For five on a line, you could receive up to £400! The bonus rounds of the game are triggered by three or more scatters. Here you’ll get to select smoothies to reveal multipliers. Amazon Wild is a beautiful 5 reel and 100 payline slot game located in the deepest parts of the jungle. This slot game features some of the most rewarding elements such as: wild symbols, multiple bonuses and plus the game can be played from mobiles, desktops and tablets. Amazon Wild slots surely lives up to its name with the various symbols landing on the reels. Symbols like: Monkeys, Lizards, Frogs, Chameleons, Panthers, Birds and Flowers. This sort of slot game will make you feel as if you’re on an adventure, ready for an adrenaline rush. Themed on Sinbad, the sailor who set out on the seas and visited magical places, faced the most dangerous monsters and encountered supernatural phenomenon’s. Sinbad’s Golden Voyage slot is a six reel and 164 payline game that includes expanding wild symbols and free spins. With an RTP of 97.01%, get ready to set out on an amazing and thrill filled slot game at Betfair Bingo! Let giant wild symbols increase your winning potential and up your winnings. These are not all of the slot games present at Betfair Bingo. Enjoy a wide variety of slots as well, packed with loads of fun, features and wins. Stand a chance to win mega prizes on the most exciting bingo promotions, tournaments, loyalty, and VIP lounges. Play on the most exiting slot games and bingo rooms that are differently priced. Enjoy bingo rooms like: Helter Skelter, Roller Coaster, Rainbow Riches, Cash Cubes, Bouncy Balls and The Big Wheel.